The Avalon EC-864L is a booming 64-jet hot tub in a eight-foot size configuration with exclusive lounger seat to accommodate up to six. The EC-864L features 64 stainless steel candy cane jets, pillow headrests, and a curved cascading waterfall. Upgrade your hot tub with a Freedom™ Sound System Bluetooth with powered subwoofer and speakers. 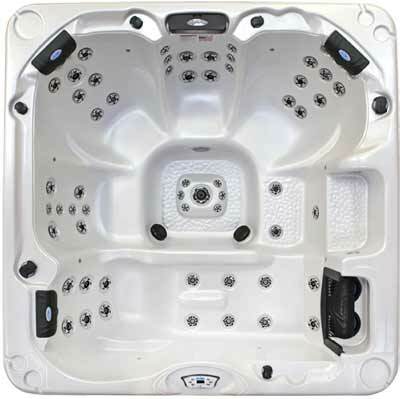 The EC-864L gives you hydrotherapy and entertainment features in a space-saving size. Dimensions: 93" X 93" X 39 ½"